When things are essential, important, dearly needed and deeply desired, call them des____ata. And when things are the first and the last, the bread and butter, the be-all/end-all, call them the alpha and omega. In the Greek alphabet, the first letter is "alpha" and the last letter is "omega." So, "alpha and omega" basically means "everything, as in A to Z," or "the beginning and the end." Originally, "alpha and omega" was a name for God. (It's supposed to mean that he's timeless.) Here are some of the quotes from Revelation. It's the Lord talking: "'I am the Alpha and the Omega,' says the Lord God, who is and was and is to come — the Almighty." And: "I am the Alpha and the Omega, the First and the Last, the Beginning and the End." More generally, "alpha and omega" means "the essence of something, the entirety of something, or the most important part of something." Talk about the alpha and omega of something. The phrase "alpha and omega" adds some heavy drama to your sentence. It's got that serious, Greek, biblical flavor to it. To put it into a sentence, we usually follow this pattern: "_____ is/are the alpha and omega of _____." For example, the star player on the team is the alpha and omega of its press conferences; fossil evidence is the alpha and omega of evolutionary science; overworking yourself is the alpha and omega of a medical career in Houston. Or, we can say that something is someone's alpha and omega, meaning she eats, sleeps, and breathes it: "Running is their alpha and omega. Their lives revolve around training for the next marathon." Their breakup destroyed her: he was her alpha and omega. Gene Roddenberry envisioned the humans (and humanoids) in his Star Trek universe as so advanced that they had transcended conflict; he asked the writers to come up with conflict-free plots for episodes. It didn't hold. Conflict is the alpha and omega of storytelling. Look away from the screen to explain the definition in your own words. You’ll know you understand what "alpha and omega" means when you can explain it without saying "most important part" or "essence." Fill in the blanks: "(I'm fascinated by, or, I take issue with) (certain people) who consider _____ the alpha and omega of _____." Example: "I take issue with instructors who consider the five-paragraph essay the alpha and omega of composition." 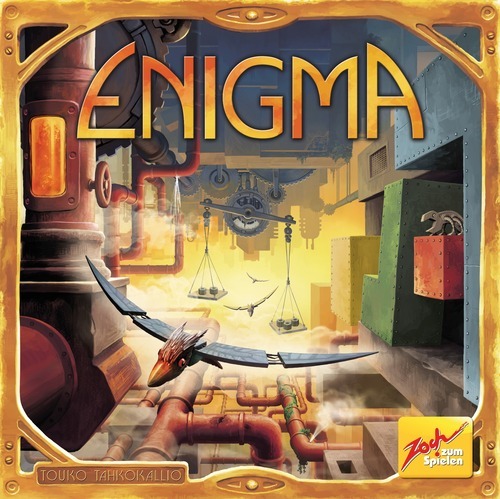 Answer: Enigma. Check out the game here and the word here. 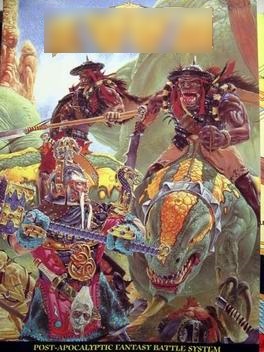 Designed by Bill King and John Robertson, this game has players pitting creatures like orcs and titanosaurs against each other in combat. The game's title means "anything enormous and/or powerful enough to remind you of a sea monster." (Often it's a ship, but it could be anything, including a person. Especially a wealthy one.) It's pictured below, with the title blurred out. What game is this? 2. It wasn't until I got to college that I learned this: _____ is not the alpha and omega _____.